Having to trade shredded junk and only shredded junk is only there to satisfy the discord community. Again, you underestimate Discord users and overestimate their influence. I've not seen anything positive, before or after, anywhere, about this decision. Discord really has little to no effect on the game content. If you're going to keep suggesting that Discord is controlling the game, please provide adequate evidence. Or you could just tell the devs what it is, a bloody stupid idea in a game where resource collection features so heavily. No need for side-swipes at other communities, it's the devs making these obscure decisions. so 10.2 is upon us and we have a multifarious diversity of resources to play with! what could be better? no, no, don't get me wrong here. I've spent some hours in the new update and i totally see the appeal. love that there's more stuff in the world, like that you can get into planet hopping quicker and easier than you once did, don't even mind the extra peril that some of the new mechanics bring about - after all, what's exploration without a bit of peril? no, i can see how the crafting and resource expansion really does enhance this game mechanic, so hats off, guys, this is pretty much working well, and definitely a step in the right direction. but that is diminishing. it's being replaced by a need to keep busy, to run about collecting things so you can craft or process or smelt or trade to get more things to build stuff to do what? to be able to collect more things and go around again, except perhaps on a different planet. i'm starting to feel like a hamster in a wheel - just keep running around, don't ask why. guys, I'm beginning to ask why. and there's so much potential out there. when i first began playing, finding wrecked ships and derelict bases filled me with excitement. what if you could search them for unique objects? what if you could use resources to fix them up, make them functional again? what if they were part of a discovery process whereby you recovered tech and researched and built new tech, and together they made a whole new thing, like a satellite system, or an orbital base? but now the hollow truth is in: old space junk is just that, junk. shred it into resource lumps and trade it for more resource lumps. same with the planets themselves. i love looking at the world, but it's beginning to get like an old set of holiday snaps - been there, saw that. even from world to world, the main difference seems to be colour palette rather than a genuinely diverse set of ecosystems. i really thought that, if i looked hard enough, i would find something truly cool, like evidence of an ancient civilization sticking out of a cave wall somewhere. is it any wonder that the stripy spheres, which were put in as graphics tests, have gathered so much speculation and interest? people are looking for more meaning here. not necessarily more things to do. the game mechanics have their problems, as all game systems do, and you can change or expand them all you want, but i'm afraid that they wont make up for a lack of purpose at the heart of this game. because some of us are still asking why. Quite enjoy the change from power nuggets to organic resource. but when could we see/use those mechanisms that are in the Tutorial that are on the trees creating harvestable organic overtime? any response would be appreciated. I understand where your coming from and the team at System Era is building towards that exact experience your asking for except they need to keep us busy somehow (with this update). Also I think the beauty that your looking for on each planet and the change of colour palette is coming soon, look forward to their Terrain 2.0 update that is coming before the full release and that's where I think you'll see that beauty your looking for my friend. Byte and material cost for hydrazine thruster for the small shuttle appears to be a little to high, if you want it as a upgrade in before medium or large shuttle. Currently it's more efficient to go for medium shuttle instead, both byte and material wise. Yeh.. want a story.. a reason for being. And a good one. I think the cost of a solid fuel thruster is appropriate. One aluminum for the basic structure, one ammonium for the fuel. Maybe make it a 2-use thruster instead of a single use? Thank you very much for changing the way rovers drive. Even after I got used to the way they used to work, I hated it. This is much, much better. I'm not really sure why so many are down on the Solid Fuel Thruster. I feel like it's a pretty elegant solution that balances cost/benefit, and time from start to space. Nothing will ever be perfect, but this is simple and also encourages resource planning. I think that is a positive. Now for my overall feedback. What an outstanding patch. 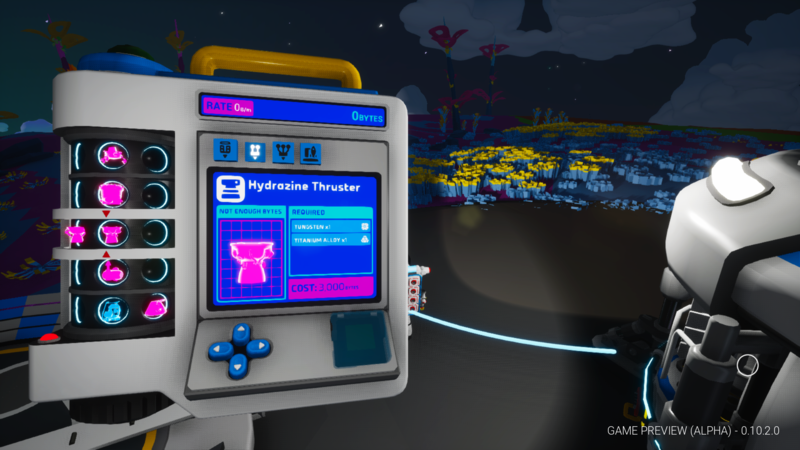 Out of all my early access games I've tried, Astroneer never disapoints. There are a few buggy/glitchy areas I'd like to point out. First, I seem to randomly lose the ability to pick up items or open my backpack with the mouse/main input. When this occurs I can open my catalog, interact with Q and E functions. But not resources, moving platforms or modules. Non-Terran worlds also appear to be a bit buggy. My terrain tool seems to have issues using the level tool. The holograms on my backpack printer shake/vibrate. I've also experienced being flung into the air suddenly and being dropped and killed. I've posted some of this in the bug topic but I thought I would repeat here for feedback. Things I'd like to see in the future: I want more day-to-day tasks. Maintanance and cleaning. Repairing. I'd like to see storms deposit dirt on modules that do t get used, moved or otherwise interacted with. And on tundra planets maybe a new terrain tool attachment to melt blocks of ice of machines and components. Something like that might also lead into new gameplay features that require thoughtful planning that is still intuitive. I would also like to see a map and compass. Also can we get gold and silver added to the game!? They be so fancy! It has the same byte cost as the medium shuttle and material cost (1 titanium alloy 1 tungsten) as half of the large shuttle. Fuel wise it uses the same amount of ammonium as the one use thruster, all it saves you is the hassle of crafting more and one aluminium ? After putting another dozen hours of play in since the new patch, I'd like to refine/amend my initial feedback. Overall most of what I said is still true: I do really love the update, and I am still very happy with the new light shuttle (although I've graduated up so that I can hold more resources both for establishing new bases and for my trucking runs). And I cannot wait to see what terrain 2.0 has in store for us! To recap my main constructive criticism, I had posited that since one is required to go off planet to get access to resources, that having finite ammonium supplies was an issue. I had initially recommended adding ammonium to the soil extractor so that doing later game "trucking" of resources between planets wasn't so limited by the time and luck at finding ammonium deposits. But with deeper reflection this seems to be a symptom of issues with the current balance, namely that a player is pretty railroaded into one way to progress because there is typically only one reasonable way to get any particular resource. For example, to obtain Iron, I first *have* to build-up to a small shuttle, so that I can go to one of the three planets that has the appropriate ore, and then truck it back to my home base to use for whatever goal I'm trying to achieve back there. The same problem exists on whichever planet I visit: I am pretty railroaded into one logistical pathway to get at whatever resources are wholly unavailable on that planet. 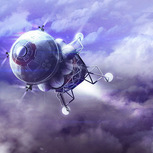 I'd love to see more decision making ability in regards to gathering resources; for example, maybe this play through I want to be a space trucker, harvesting resources from other planets, and bringing them back to my home base; maybe another play through I want to be a nomadic scrap collector, never leaving my home planet, but instead moving from place to place finding scrap and selling it for the resources I need; and maybe another time I want to establish a permanent grid of tethers all around Barren, building a giant systematic network of mines, collecting resources, and selling them on the trade platform for the resources I can't otherwise get. In all cases, it seems like a better balance is needed between what resources are available on the planets (I'd lobby for all of them on all planets, but sometimes being very rare), scrap machines and trade platforms being easier to get earlier in the game, and trade platforms being more versatile than they currently are, so that I can utilize them to more easily get access to small numbers of materials I can't find, without having to go on an epic voyage just to finish my current self-assigned goal where I am. Essentially, I want to again be able to explore on my own terms, rather than focus on one-size-fits-all grind of resource trucking. I have to disagree with some of your notions. I've been finding plenty of ammonium. And I haven't even explored/exaveted 20% of the terran planet. Probably a lot less. And ammonium seems to be very plentiful on other planets as well. Gotta spend ammonium to make ammonium! additionally, I'm not quite sure it would be possible for this game as it is designed from the ground up to be anything other than linear unless they made every resource so easy to find, that it negates the need to travel off world or really do any exploration. And if it is so rare, your better off following the laid out progression path to move forward at all anyways, making the change essentially useless. Other than resource acquisition, there really is nothing stopping you from playing in any of the ways you described, but unfortunately resource acquisition is a pillar of which the game was built on. I did see in the dev map that they want/ plan on making a free play mode. That might solve a lot of that later down the road. titanium alloy should use something like carbon instead of graphene. cant a dude just go exploring for the sheer love of it anymore? does there always have to be a reason? and does that reason always have to come round to crafting stuff keep exploring to keep crafting stuff? one day i will go to irradiated because i want to see the sunset on that world, or to exotic to hear the sounds in the caves, or travel to barren to be able to jump-fly in ultra-low gravity. maybe soon, with T2.0. but not today. That's just basic human nature and game design, you've gotta have something to get otherwise there's no point in exploring. That's just basic human nature and game design, you've gotta have something to get o﻿therwise there's no point in exploring. CURSE YOU, BASIC HUMAN NATURE!!!! i have to say that he few games i come back to on a regular basis are a lot more than a bunch of mechanisms to improve, they are beautiful or terrifying or thoughtful experiences in their own right. properly thought out, this game has the potential to be one of these games. the grind doesnt have to be abandoned, but it must be complimented with other components to allow the game to reach a broader audience. your point is well made, tho. Personally, I'm not going to "explore" very far if it's just to find resources - the game needs to provide better motivation (which, hopefully, is in the works with interesting discoveries, or alien ruins, or blueprints for alien technology, or... something). Likewise, I'm not going to keep playing if I never "level up", and have to grind just as much for the basics after hours of playing. Or if I'm forced to planet-hop just to get the basics. Upgrades for modules like the Research Chamber or Smelter, that improve their "top speed"
Vehicle performance upgrades: top speed, torque, sharper climbing angle, etc. Speak for yourself, why do you think people travel or go on a road trip! Probably because they are bored stiff with their lives and want to experience new things, same goes with this game. Not all of us play Astroneer to build "Dinosaurs" or "Racetracks" or even build Bases. Some of us just want to go on an adventure, experience new challenges & danger. It's not like there's nothing to do in Astroneer, it's just that there's nothing "meaningful" to do, that's why I will constantly restart the game from scratch. This is a great idea, having prerequisites for you to land on a certain planet would definitely make the game more interesting. Besides different suits, you could also include different landing ships. Totally agree - I think exploring should be because there are interesting sights to see, or stuff to find... or because you feel like looking for better resources or loot. 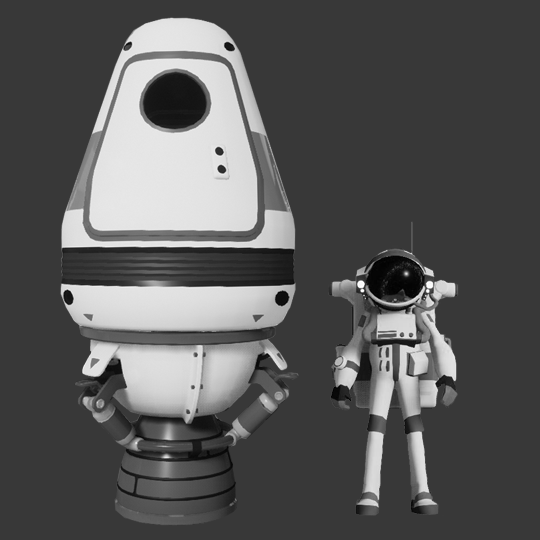 It doesn't need to be one or the other, but Astroneer seems to be moving more and more towards trying to force everyone to follow the same path, rather than find/ explore their own. I can appreciate all the work that went into the reorganization of the resource / crafting system in Astroneer, but it's changed the way I play the game for the worse I'm afraid. As an example, building the large shuttle is now so tedious and requires so many steps that it's just not 'worth it' in terms of game play. Solution? Slum it on the small shuttle and build what you have to when you get there instead of hauling gear around on the large shuttle like I used to. Example: Titanium Alloy. Ugh, not going through that again. I feel like you've dissuaded the player from using some of the more interesting vehicles / resources in the game just by making the process of crafting the resources so tedious. I don't mind having to go to Arid to get element XYZ but having to take 4 separate steps to concoct it into something usable is a hassle. While we're at it, the small shuttle / solid rocket booster is scientifically inaccurate, did you guys look up how Solid Rocket Booster technology actually works? While it's actually technically correct to use Aluminum and Amonium as components for the booster, the way it works in-game is just not believable. Once you light an SRB there is no 'OFF' button, they are on until they burn out, so being able to turn them on / off again in the game play while moving between planets is pretty goofy and takes away from what you've done here. Revisited the small shuttle this weekend because of comments made by other players and also because I had nothing better to play. I'd have to say that the solid fuel thruster is pretty much our only option for leaving the planet to gather tungsten & iron to complete the build of the chemistry lab and the atmospheric condenser. Even if you have the chemistry lab operating, you can build the medium shuttle but no way to fuel it because you need the atmospheric condenser to produce hydrazine. So we are left with the fuel thruster as a means of transport between planets until the condenser is operational. Like I mention in a previous post, that the solid fuel once it's lit, it will burn until it runs out. So keeping with that idea, how about changing it up a bit by creating a new launch vehicle that uses the solid fuel but only as a means to transport you into orbit. From there, you choose to dock with the huge ship in orbit that we've seen in the E3 announcement or land in different areas of your current planet. Here's something I put together, it uses the old habitat plus the solid fuel thruster. It's not like we used the old habitat that much anymore and I'm guessing that in the future, we'll be able to build the new habitat. So I was thinking why not use the old habitat as a capsule and attach it to the solid fuel thruster. So once you launch, it will propel you into orbit and at a certain point, it will detach the solid fuel thruster from the capsule. In my opinion this better reflects the purpose of the solid fuel thruster, limiting it's range to what it's capable of doing. This also goes for every other shuttle designs, the larger shuttle, the more it's capable of reaching further orbiting planets. This will probably require adjustments of the current recipes to accommodate this option. On a final note, the reentry of the capsules at the start of the new game has been very uninteresting for a long time now and why not spice it up a bit. Perhaps during reentry, instead of using thrusters to land, have a parachute popout and descent to the surface. It would better reflect the abandoned capsules that we see littering the surface.